Admit it, you’re secretly dying to know what other people think of you - what they say behind your back that they would never say to your face. Do they really like you, or are they just being nice? After some of our international student friends told us they’d love to know what their American classmates really think about them, we devised a way to find out – an anonymous survey. Over 50 American students responded to our online questionnaire, sharing their most honest thoughts about international students. Not to let the Americans off the hook, we also gave the survey to over 50 international students, and we'll be discussing the responses in a series of posts all this week. Take a deep breath. Are you still here? Are you okay? As is often the case, the reality of how Americans feel about international students is somewhere in between these two extremes. Both our American and international student survey takers were split nearly in half over how well they relate to the other group. Exactly 50% of international students said they relate to Americans as well as or better than they do other international students. 60% of the Americans who took our survey said they relate to international students as well as or better than other Americans. Among those 40% of Americans who said they sometimes struggle to relate to international students, many cited cultural differences as a primary reason. Others noted that a lack of English skills can be an obstacle to getting to know their international classmates. One American student at North Dakota State University even said that they get scared to approach international students because of the language barrier. And both groups sometimes feel that the other isn’t putting in the effort to bridge the gap. “When they’re in their own country and there’s a minority outsider who they’ll have to put particular effort into getting to know, I think most of them just don’t bother,” said one international student of American classmates at Oberlin College. Are international students just a curiosity? Despite the challenges, the majority of American students who took our survey - 55% - said they’d like to have more international students on their campus. Only 10% said they wouldn’t want more international students at their school, and some of those explained that their campus already has a large international student population. 35% responded that they didn’t care either way. There’s certainly some truth to that. When asked why they want more international students on campus, many of the Americans in our study used the word “diversity” (9 respondents, to be exact). But for many this interest in diversity seems more than superficial - they also talked at length about the opportunity to learn about other cultures and other parts of the world. “I make an effort to get to know them because I think all of their international backgrounds and cultures are so fascinating and I would be truly blessed to get to experience a small sense of their life through what they tell me,” said a North Dakota State University student. And if the cultural education is a major reason why Americans like having international students on campus, it may be a much-needed and much-valued reason. The international students in our survey who said they had difficulty relating to Americans said it's because Americans “live in [a] different world altogether.” They have been raised in “the ‘American Bubble,’” as one College of Wooster student called it. The truth of the matter is that there is no single way in which Americans view international students. Some are particularly eager and open to meeting their international classmates, while others are perfectly happy to stay with the friends they find easy and familiar (and the same goes for international students, by the way). 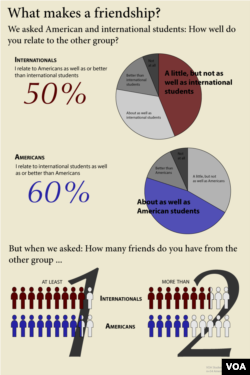 Part 2: Why Aren't Americans and International Students Becoming Friends?